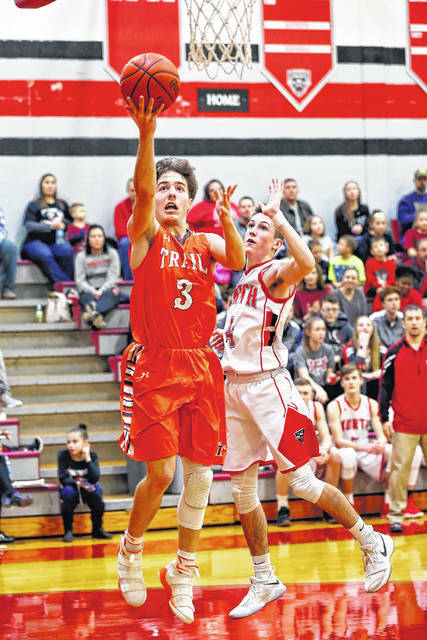 National Trail’s Dalton Mason puts up a shot against Tri-County North on Saturday, Feb. 3. Trail struggled from the field, shooting just 22 percent from 3-point range, in suffering a 62-51 loss. 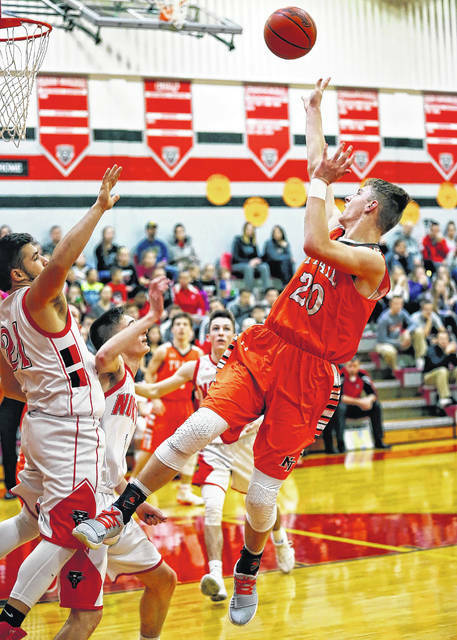 NEW PARIS — National Trail’s boys’ varsity basketball team split a pair of games this past weekend. Both games were against Cross County Conference opponents. The Blazers opened the week’s action with a dominating win over Newton, at home, on Friday, Feb. 3. NT took advantage of an “undersized” Newton squad and came away with a 69-37 win. The Blazers jumped out to an early lead, up 21-10 by the end of the first quarter. Newton was unable to respond as NT cruised to the win. 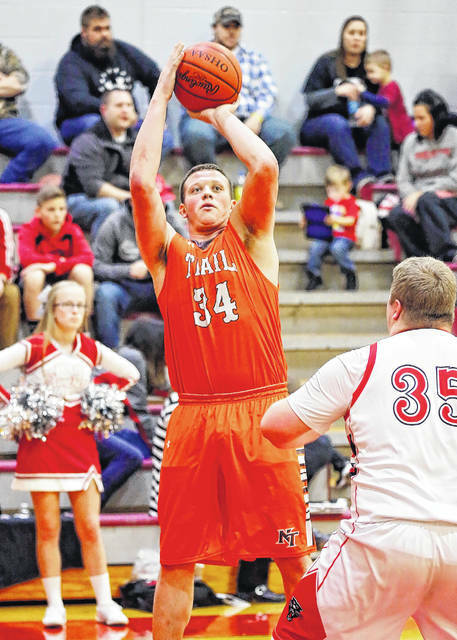 NT center Dalton Mason led the effort with 20 points and 15 rebounds. Cameron Harrison scored 12 points, along with Travis Hunt nine, Malachi Short eight and Hunter Michael six. Zach Woodall handed out five assists. Harrison added, his squad out-rebounded Newton, 48-24, and scored 46 points “in the paint” while committing just seven turnovers. 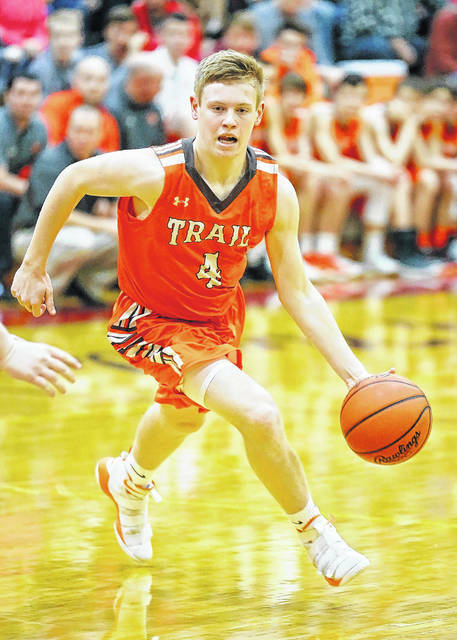 On Saturday, National Trail traveled to Tri-County North as part of a full day of basketball action, including the girls’ teams. The day included four games with JV and Varsity teams playing back-to-back. The boys’ squads took the floor as the finale of the day’s action. The two teams played even early on, but TCN was able to slowly build a lead mid-way through the first quarter and led 17-10 at the end of the period. By halftime, the Panthers had stretched the lead to double-digits at 29-18. TCN maintained the advantage in the second half and posted a 62-51 win. National Trail struggled offensively throughout the game, according to Harrison. He added, the Blazers missed 19 shots on the inside and hit a season-low 22 percent from three-point range. “North is a good basketball team, and they really put it to us for the first two and a half quarters. We struggled shooting and we struggled to keep them in front of us defensively. When we were forced to help they knocked down shots. Harrison led the team with 24 points — 20 in the second half. Hunt also had 10. The split puts NT’s overall record at 11-7 (5-4 CCC)on the season. 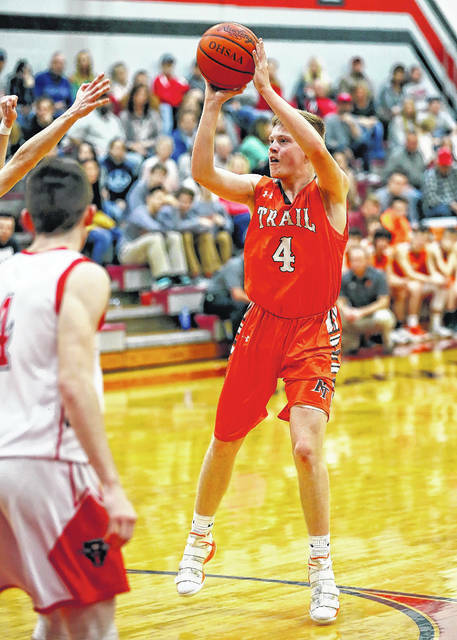 The Blazers will stay in the CCC for their next game, hosting Franklin-Monroe on Friday, Feb. 9.
https://www.registerherald.com/wp-content/uploads/sites/41/2018/02/web1_NT-BB-2.jpgNational Trail’s Dalton Mason puts up a shot against Tri-County North on Saturday, Feb. 3. Trail struggled from the field, shooting just 22 percent from 3-point range, in suffering a 62-51 loss.